This species of pitcher plant is tropical in origin from somewhere in the Old World Tropics (the complete range of all of the species of Nepenthes is included at the bottom of the blog post courtesy of Wikipedia). 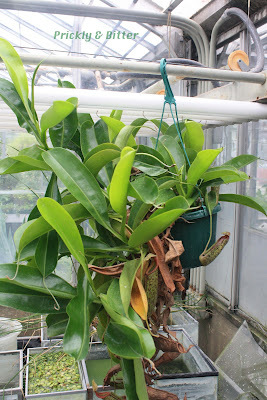 The label on the plant says it's a hybrid Nepenthes, but the label corresponds to a hybrid that looks nothing like the pot hanging in the greenhouse. Perhaps the pictures on the internet are wrong...there aren't many of them. For now it's probably just safe to say it's a hybrid and leave it at that. 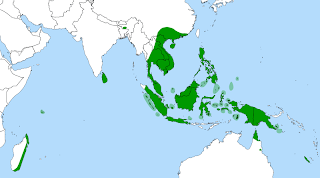 Nepenthes species (there's about 140 of them worldwide) are almost all threatened, endangered or critically endangered. 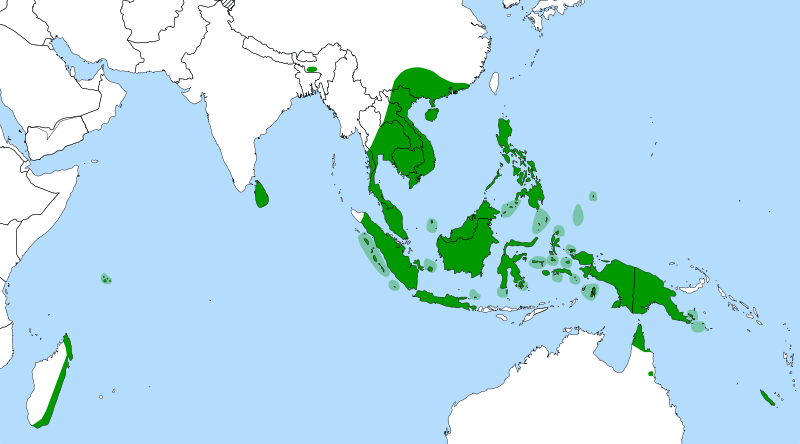 There are only a small handful that the IUCN and CITES consider of "least concern," but there are also quite a few that are considered "data deficient." For those of you considering going to graduate school, here's a project idea: catalogue the pitcher plants in Borneo and Sumatra, and come up with a monitoring program that involves going back into the bush and re-counting populations every year to judge reproductive abilities of a single plant and of a colony, plus motion-sensor video monitoring of the traps for what they're catching and what's consuming or destroying the plants. Mix that with cataloguing indigenous knowledge of the pitcher plants and what they're used for, and you've got yourself a PhD! I wish I had of thought of it sooner...sounds like an awesome time. I profiled a native Canadian species of pitcher plant a while back (for a refresher, you can read all about it HERE), and if you remember what that species looked like you can see that the pitcher traps or pitfall traps are very different than what grows from Nepenthes plants. 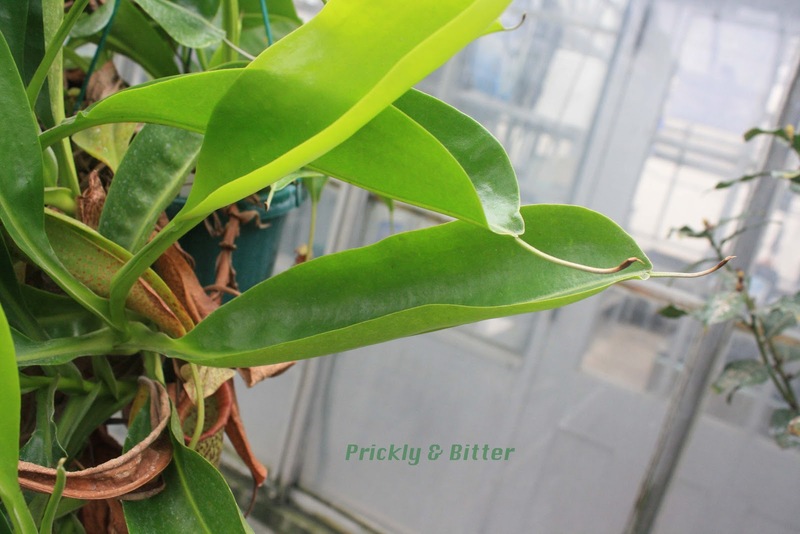 First of all, Sarracenia traps grow on the ground with the rest of the plant in boggy, swampy areas while Nepenthes grow in rocky, mountainous areas and the traps hang off of the leaves. The traps of the North American pitcher plant have curled lips that funnel rainwater into the trap (and is also very slippery to funnel bugs in, too), while the Asian species have a lid to prevent rain water from overflowing the trap and shelters the traps from falling debris. And the best part? The two groups aren't related to each other at all! The pitfall trap has evolved at least two separate times over evolutionary history, each time converging on what, today, looks like a nearly identical structure. The functions are identical as well; both groups have traps to catch insects to digest, but also act as vital breeding habitats for insects with aquatic larvae like mosquitos. One of the biggest differences between the two groups, and the main characteristic that should lead you to believe that the two groups aren't related, is how the traps are formed. In Sarracenia, the traps are basically the leaves. The traps start to grow out of the rosette stem (a stem that is very reduced in size, and never reaching very high above the surface of the ground; the leaves and other plant organs radiate out from this point like the petals of a rose) as photosynthetic organs, and start to produce digestive liquid on the inside once mature. If the plant is going to produce normal leaves, they are completely separate structures that grow out of the rosette at the base of the plant. 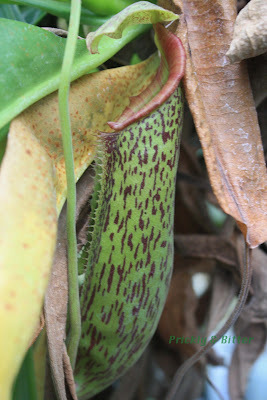 In Nepenthes, the traps actually grow off of the already-existing leaves. The leaf grows out of the stem rosette, photosynthesizes for a while, the starts to grow this long projection from the tip of the leaf. This projection continues to grow for up to 2 meters, eventually developing into a trap at the tip. Once the liquid inside the trap has been consumed by digested prey and the plant has absorbed all of the released nutrients, the trap and the entire leaf dies and falls off (very similar to the way that a Venus fly trap operates). If you would like to start a Nepenthes collection in a greenhouse or in your home, it's entirely possible. There are enormous collections of these species in greenhouses around the world, and new cultivars and hybrids are being created every few years. The trick is how the plants were obtained. Collecting seeds and propagating the plants from seeds is illegal according to international biodiversity laws. If you are caught doing that, or caught with plants propagated this way, you may go to jail. This probably wouldn't be good, so make sure you know where your plants are coming from. The good thing is that the leaves readily regrow plantlets in tissue culture when exposed to the right hormone concoction (many plants are grown in tissue culture; tobacco being the most common). This means that only a tiny portion of a leaf is needed to grow the first plant (less than a square centimetre), and all other plants can be made from this parent plant. The downside is that all plants are clones, but if you're just growing it inside it doesn't matter much. If you're growing them to replant in the wild, this would be an enormous problem because of pathogen threats to genetically uniform populations. Make sure you ask your source of Nepenthes how they were grown and where they were collected from! If the person doesn't know, don't buy it.